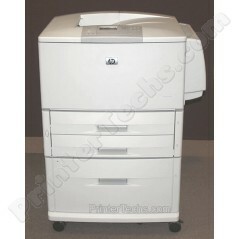 The HP LaserJet 9050 is a large workgroup printer. The base model includes a network card and two 500-sheet paper cassettes. Many upgrade options are available, including duplexers and optional feeders. Pictured on the left is the deluxe model, with both optional feeders installed. These printers are capable of handling many paper sizes, up to 11"x17". This high volume printer prints at 55 pages per minute, has excellent build quality, and is designed to last into the millions of pages. This is a large printer; it ships on a pallet via freight truck. The HP LaserJet 9050 is a large workgroup printer. The base model includes a network card and two 500-sheet paper cassettes. It is capable of handling many paper sizes, up to 11"x17". The printer weighs in at about 135 lbs without the optional 2000-sheet feeder pictured at left. The 2000-sheet feeder in the picture is a separate option - call us for availability. This high volume printer prints at 55 pages per minute, has excellent build quality, and is designed to last into the millions of pages. The massive toner cartridge is rated at 30,000 pages, and if you buy one of our toner cartridges, this comes out to a half penny per page, $.005. We rebuild this printer with Genuine HP Parts; they're more expensive than the cheaper aftermarket parts but give you better reliability and longevity. Because of this printer's size, it only ships freight on a pallet. Call us if you need an exact freight quote. -- Duplexer for double-sided printing. 23" x 25.5" x 24.5"